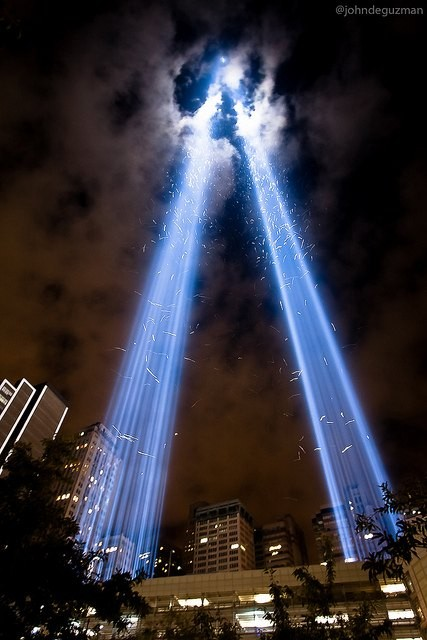 John de Guzman’s photo of New York’s “Tribute in Light” memorial, which commemorates the September 11 attacks, is astonishing, ghostly and majestic. And it is resonating widely online: Some 500,000 people have viewed it in the last 12 hours. * Though the caption on the photo’s TwitPic page says it shows you what “the ground zero site looked like this evening,” that’s not true. De Guzman took the photo of the memorial a year ago. * De Guzman doesn’t want people looking at the TwitPic image at all. Even though his name appears via watermark credit on the top right of the photo, he didn’t give “@DesignedMind,” the Twitter user who took a screengrab of the image, permission to place it there. If you’re going to look at the photo, de Guzman asks, please take a look at his SmugMug or Flickr pages. Hold on. This is the Internet. Where ideas and images and information want to be free, right? If you don’t want someone to see something you’ve made, you don’t put it online, right? I’m quite sympathetic to de Guzman’s argument, because the digital content I make for a living is supposed to be consumed in specific places, too. But it frequently isn’t — it gets quoted without attribution, or lifted wholesale without links, etc. — and usually I just accept that as a downside that comes with the many upsides the Web provides for information makers. Add in the concept of “fair use,” which is both crucial and muddy for old and new media alike (de Guzman gave me the okay to use his image in this post last night), and you can see how tough it is for image makers to control their own work. But that doesn’t mean we shouldn’t try hard to do the right thing. Particularly when it’s easy to do so. The New York Post, whose Twitter account linked to the TwitPic image last night and made the thing go viral, has now put up a new tweet linking to de Guzman’s Flickr account. Both the Post and this Web site are owned by News Corp.
* I’ve been just as bad about this as anyone, though I’m trying to improve. For instance: Turns out the monkey avatar I’ve been using on my Twitter profile for several years comes from graphic designer Andy Rainford. Andy reached out to me — very politely — this summer, and since then I’ve been crediting him on Twitter, and now again here.